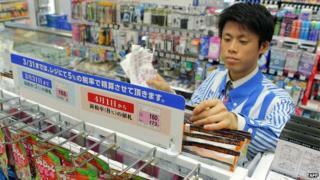 Japan has raised its consumption tax for the first time in 17 years in an attempt to rein in public debt. From Tuesday, sales tax will increase from 5% to 8%. It will rise again, to 10%, in October 2015. Prime Minister Shinzo Abe said he would continue to take "necessary action" to address livelihood issues and keep Japan's economy on track. The stepped tax increases are aimed at covering rising social welfare costs linked to Japan's ageing population. Japan currently has one of the lowest birth rates in the world. It also has the world's highest ratio of elderly to young people, raising serious concerns about future economic growth. The last hike in 1997 saw Japan's consumption tax - the equivalent of VAT (value-added tax) or sales tax - rise to 5% from 3%. Almost immediately afterwards, Japan plunged into a deep recession with a lasting impact: the country has struggled to escape the trap of deflation, or decreasing prices, almost yearly every since. A tax increase has been discussed in Japan for several years, but it has always been perceived as highly unpopular with the electorate. The current rise is expected to present a challenge to Mr Abe's aim of forcing Japan's economy out of deflation and serial recession. Separate data on Tuesday indicated that those concerns are shared by the business community. The results of the Tankan survey, which polls more than 10,500 Japanese companies about their business outlook, indicated that Japanese firms were not optimistic about the rest of the year. However, analysts say Japan's economy will have a better chance of surviving the tax rise this time round. "Everybody was extremely worried because of the bad impact of the last hike, but this time it seems to be widely accepted," Martin Schulz, an analyst at Fujitsu Research Institute, told the BBC. "Demand is strong and it will not drop that much as many have been fearing." Video Has Abenomics fixed Japan's economic fortunes? Can 'Abenomics' fix Japan's ailing economy?